SBS. 2007. Host: Les Murray. CD (ST) Universal. 9840509. 2006. "WORLD GAME 2006". CD (ST) Phantom. 689141. 2007. 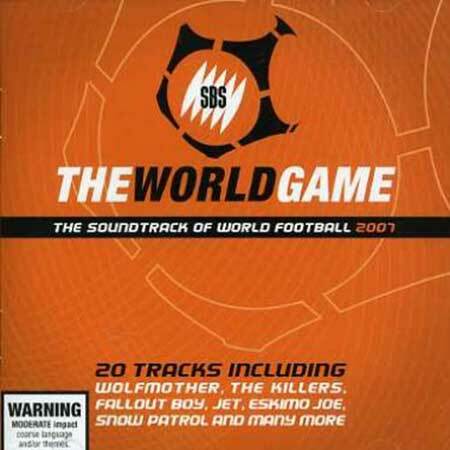 "THE WORLD GAME THE SOUNDTRACK OF WORLD FOOTBALL 2007". 2CD (ST) Universal. 2009. 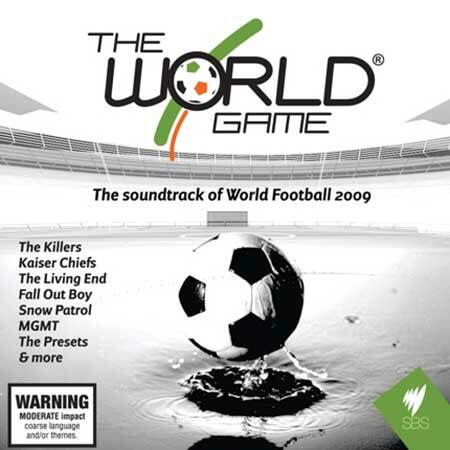 "THE WORLD GAME THE SOUNDTRACK OF WORLD FOOTBALL 2009". 01: White Noise. The Living End. 02: Never Miss A Beat. Kaiser Chiefs. 03: When You Were Young. The Killers. 04: I Don't Care. Fallout Boy. 05: Always Where I Need To Be. The Kooks. 07: Crack The Shutters. Snow Patrol. 08: I'm Not Over. Carolina Liar. 10: It's Not My Time. 3 Doors Down. 12: Living For The Weekend. Hard-Fi. 13: Silence Is Distance. Yves Klein Blue. 14: Social Currency. Children Collide. 15: Just For Tonight. One Night Only. 19: One Day Like This. Elbow. 01: Time To Pretend. MGMT. 02: Talk Like That. The Presets. 03: Just Dance. Lady GaGa featuring Colby O'Danis. 04: 21st Century Life. Sam Sparro. 05: Let It Rock. Kevin Rudolf featuring Lil Wayne. 06: It's A War. Dukes Of Windsor. 07: The Creeps. Camille Jones vs Fedde le Grand. 08: Lights & Music. Cut Copy. 09: A Sharp Knife. Van She. 10: She Bites. Poxymusic featuring Nicole Lombardi. 11: Makes Me Wonder. Maroon 5. 12: I'm Not Gonna Teach Your Boyfriend How To Dance With You. Black Kids. 13: I Woke Up Today. Port O'Brien. 15: All The Money Or the Simple Life Honey. The Dandy Warhols. 16: Forever Young. Youth Group. 17: I Can Be. Taio Cruz. 19: The World Game Theme. Ken Francis. 2CD (ST) Universal. 5326320. 2010. 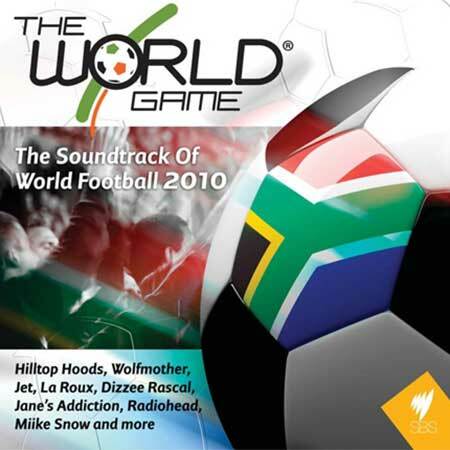 "THE WORLD GAME THE SOUNDTRACK OF WORLD FOOTBALL 2010". 01: Chase That Feeling. Hilltop Hoods. 02: New Moon Rising. Wolfmother. 04: White Diamonds. Friendly Fires. 05: Hold On My Heart. Sarah Blasko. 08: Bonkers. Dizzee Rascal & Armand Van Helden. 10: In The Air. TV ROCK featuring Rudy. 11: Black & Gold. Sam Sparro. 12: Get Shaky. The Ian Carey Project. 14: Jigsaw Falling Into Place. Radiohead. 15: Just Because. Jane's Addiction. 16: Gives You Hell. The All-American Rejects. 17: Lit Up. The National. 18: So Light Is Her Footfall. Air. 02: Umqombothi. Yvonne Chaka Chaka. 03: Mmalo We. Bayete and Jabu Khanyile. 06: We Miss You Manelow. Chicco. 07: This Place Is Boring. Lazarus Kgagudi. 10: Gentle Rain. Wanda Baloyi. 12: O A Lla. KB. 13: Spirit Of A Warrior. Rhythmic Elements. 14: Winds of Change. Jimmy Dludlu. 15: It's About Time .Boom Shaka.